Do you recall seeing one of these at your last eye exam? This piece of equipment is a Slit Lamp Biomicroscope. 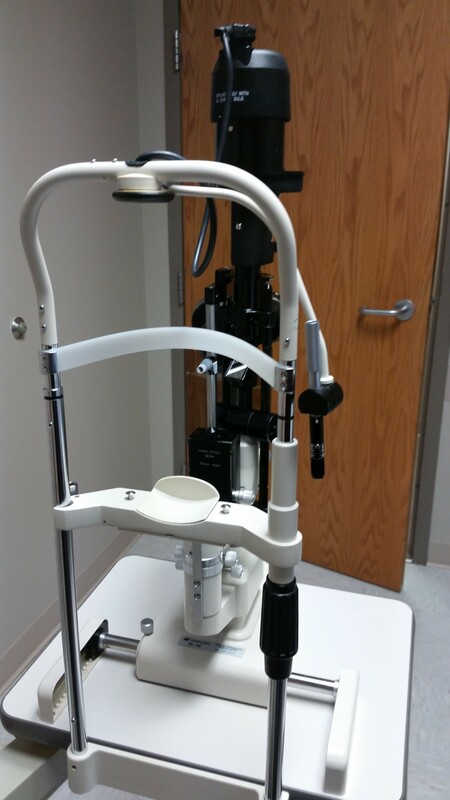 It's called a slit lamp because the light produced by this microscope can be adjusted from a broad beam to a small slit-like beam of light, in order to best view different parts of the eye. I am sure that you've seen this in your eye doctor's office in the past. This instrument originated in the early 1900s, Of course, there have been some improvements in design over the years, resulting in better optics, lighting, and ease of use. The slit lamp is used to examine the health of eye structures such as the conjunctiva, cornea, crystalline lens, optic nerve, and retina. A few of the conditions that we are able to diagnose with the use of this tool are cataracts, corneal ulcers, uveitis and macular degeneration. It's also used to assess the fit of contact lenses. With technological advances, cell phone manufacturers are creating apps and tools that attach to smart phones allowing the doctor to take pictures of the eye through the slit lamp, which can then be shown to you, the patient, in real time, allowing for detailed explanations of your eye conditions by your friendly neighborhood Ophthalmologist or Optometrist!